NFL fans rejoice, for the Xbox One will be receiving an app dedicated to giving you all of the stats and updates for your teams. Despite their other app, Microsoft has been working hard to deliver the expectations the fans saw advertised when the Xbox One was first introduced late last year. The app is scheduled to be released week one of the NFL season unlike it's predecessor app which was released in week 12 making fans not too eager to utilize it. Personalization was the key factor in creation of the app allowing you to choose content from the teams and players you are interested in. The stats and teams are being provided by professional, college, as well as fantasy league networks such as NFL Network, NFL RedZone, NFL Sunday Ticket and, of course, NFL Now. The NFL Now service already gives fans a personalized touch by allowing them to choose the players and teams that they follow giving them highlights on what they want to see without all of the added "fluff" making no two fans have the same experience. 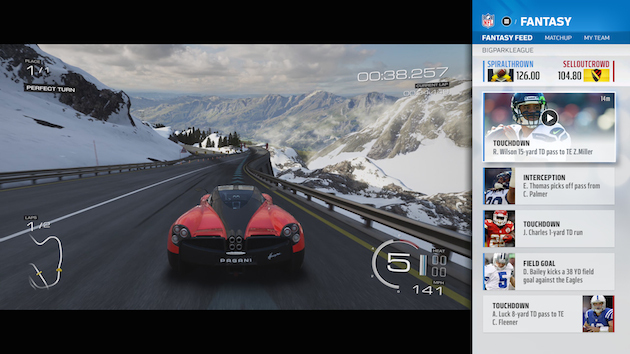 The app will also utilize the Snap feature on the Xbox One allowing you to get the in game highlights of your teams and players, letting you know the score and if your favorite player makes a touchdown even if you are in the middle of a game. The app will be compatible with the Xbox One, Windows 8, as well as phones running Windows 8 linking them all together to give you a quality experience. Even though this will not be available for the Xbox 360, the already created app will be receiving an update allowing for a similar feel. The update for the Xbox 360 app will include the NFL Now network though the more on-demand content will only be readily available to users with the other Microsoft devices. Microsoft said that they are trying to get the the NFL-rich app out by week 1 with a "late August" release. I'm not much of an NFL fan but think I this feature is a great addition to the console. Hopefully it will lead to apps dedicated to other sports, especially the NHL leagues. I will then be able to see the Red Wings win a season.